After days of speculation, SpaceX’s mystery passenger is a mystery no more — and he’s got a surprise of his own. 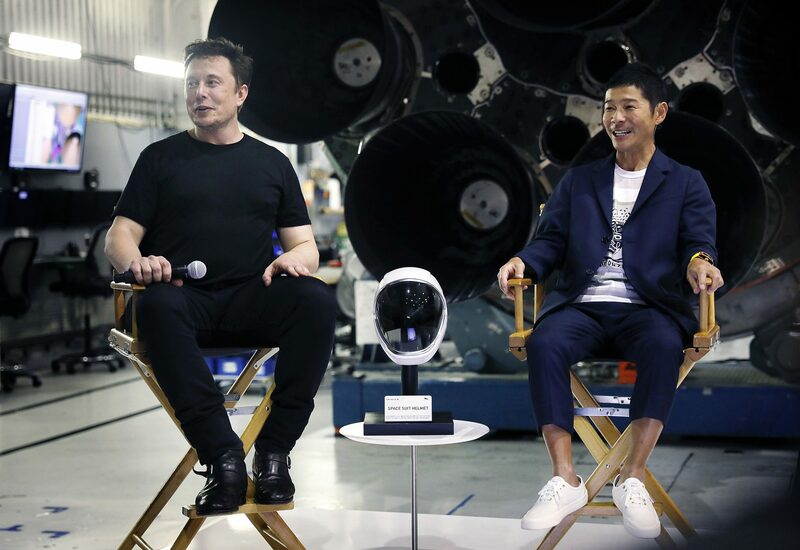 The passenger will be Japanese billionaire Yusaku Maezawa, who founded Japan’s largest fashion retail website, Zozotown, SpaceX revealed in a news conference at its Hawthorne, Calif., headquarters Monday evening. “Finally, I can tell you that I choose to go to the moon,” Maezawa said Monday night. But Maezawa’s dream to go to the moon — and fund a large portion of the endeavor — is part of a larger mission. The 42-year-old entrepreneur and art curator, who made headlines for spending $110.5 million on a Jean-Michel Basquiat painting at Sotheby’s in New York, is taking his love of art up with him to the cosmos. Maezawa announced that he plans to take six to eight “top” artists with him on a trip around the moon, scheduled for 2023. In a video promoting the trip, called Dear Moon, he asks, “What will they see? What will they feel? What will they create?” Claude Debussy’s “Clair de Lune” plays in the background. Maezawa, who is reportedly worth $3 billion, according to Forbes, said he plans for the artists to create works that express their experience in space. He has already made a sort of down payment for the journey, he said. And he’d be covering the costs for his fellow artists, who can be anything from painters to musicians to architects. 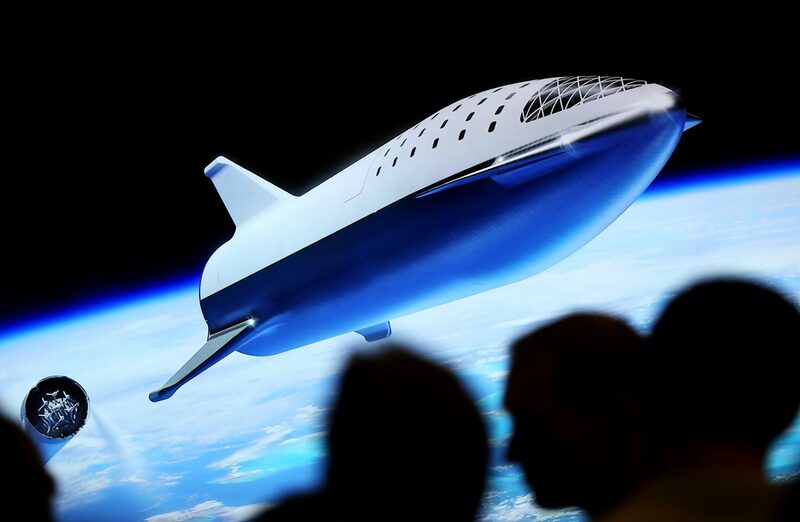 SpaceX would not reveal how much Maezawa is paying, but CEO Elon Musk said it would be a “significant” amount of the estimated $5 billion development cost for the Big Falcon Rocket, the launch vehicle the company is building for deeper trips into space. Musk called Maezawa brave and an adventurer for approaching SpaceX with the idea of buying multiple seats on its lunar trip — and donating them to others. “This has done a lot to restore my faith in humanity that someone is going to do this,” Musk said. SpaceX first announced plans to private people into lunar orbit in 2017, first saying they would ride a Falcon Heavy before swapping it out for the BFR. Since announcing Thursday night that it would reveal who one of the space tourists would be, SpaceX and Musk have tweeted updated renderings of the BFR, the rocket and spacecraft that will take the lunar journey. Musk discussed updated plans for the BFR in September 2017, describing it as the one vehicle that will eventually replace the company’s existing Falcon 9 and Falcon Heavy rockets and the Dragon spacecraft. It will be powered by 31 of SpaceX’s next-generation Raptor engines, with a rocket and spacecraft component — the Big Falcon Spaceship, or BFS. And it will be fully reusable — a first. New renderings of the vehicle, currently under construction at the Port of Los Angeles, show a slightly larger plan for the now 387-foot-tall rocket. The spacecraft component has seven Raptor engines and is about 180 feet long. “This will look really epic in person,” Musk said as he showed a model of the rocket taking off and landing. Musk said the company has already built the cylinder section of the BFR, which measures nearly 30 feet in diameter, and will be working on the dome and engine sections soon. While timelines can — and have — changed in the past, SpaceX is looking at 2023 for its lunar mission, if all goes well. SpaceX is one of several companies in a race to take tourists to space. Business mogul Richard Branson’s Virgin Galactic has been selling tickets for space tourism voyages for about $250,000. Though the trips will be far less involved than what SpaceX is planning, they will include taking riders to the boundary between Earth’s atmosphere and space, where they can float in zero gravity for several minutes before returning to solid ground. Amazon CEO Jeff Bezos’ Blue Origin has said it too wants to send tourists to space aboard its New Shepard capsule. The capsule, with room for six, would launch with a 60-foot rocket and detach, taking travelers just past the line into space before parachuting back down to Earth. Blue Origin has not yet said how much the trips would cost. NASA has lunar plans too, albeit with astronauts. The space agency’s Orion capsule is nearly complete, with plans to send astronauts using the Space Launch System rocket on a lunar fly-by in mid-2022. Ultimately, all these missions will likely be stepping stones for trips to Mars. At a space industry conference in Orlando this week, NASA Administrator Jim Bridenstine framed the agency’s planned lunar missions — and the orbiting lunar space station it is planning — as the dress rehearsals for Mars.